It's answer to how to rip DVD to Samsung Galaxy S6/Edge for DVD movies playback on these new Samsung smartphones featuring a higher 2560x1440 resolution. Q: I have ready to get the new Samsung Galaxy S6 and wanna rip my DVD collection to it for watching movies on the way to work by subway. Can anyone tell me a great DVD ripper and how to use guide? Appreciate for all advices! Samsung finally announced the long-awaited Samsung Galaxy S6 and a new model S6 Edge coming from one family at WMC 2015. The release date is estimated on April 10th. If you have prepared to buy the new Samsung smartphones and want to play DVD movies on them, the guide of how to rip DVD to Samsung Galaxy S6/Edge with a fast DVD to Galaxy S6/Edge ripper will be very helpful. Rip/Copy any DVD movies to Samsung Galaxy S6/Edge speedily with removal of strict encryptions and high quality of images/audios for a smooth movie enjoyment with the fastest DVD to Galaxy S6 ripper – WinX DVD Ripper Platinum. Both Galaxy S6/Edge boasts the delicate body wrapped with aluminum alloy and Gorilla Glass 4 frame on the front and back, lighting-fast 64-bit Octa-core Exynos 7420 chip and new features for charging, quick speed and built-in wireless charging capabilities. Differences from the previous generations, Galaxy S6/Edge adopt sealed battery and increased default internal storage with no MicroSD slot support. Meanwhile, the 5.1-inch QHD Super AMLED display (dual-edge for S6 Edge) with a resolution of 2560x1440 greatly satisfies users who would like to watch HD movies/videos with devices. Various DVD rippers in the market confuse users who are not sure for how to pick out an appropriate ripper. Based on most users' requirements, there are several standards of a good DVD ripper, ease at use, to rip any DVDs speedily, to output a higher quality. WinX DVD Ripper Platinum is such a perfect and fast program to rip DVDs (even latest-releases with advanced protections, for example Birdman, The Hunger Games: Mockingjay – Part 1, The Hobbit: The Battle of the Five) to Samsung Galaxy S6/Edge in only 3 steps and deliver crisp images and nearly lossless audio quality. Owing to Hyper-Threading Technology and Multi-core (up to 8) utility, it can rip DVD to Samsung Galaxy S6/Edge at a very high speed. This guide is about DVD to Galaxy S6/Edge conversion on Windows. If you want to rip DVD to Galaxy S6/Edge or other video formats/devices on Mac, please turn to Mac version - WinX DVD Ripper for Mac. Step 1. Import DVD disc into DVD-ROM of your computer and tap DVD Disc button on navigation bar after launching this best DVD to Galaxy S6/Edge ripper. Also, you can select to convert ISO image or VIDEO_TS folder to Galaxy S6/Edge alternatively. Step 2. All titles of DVD are loaded with main title is checked and Output Profile windows appears a couple of seconds later. Select Android Mobiles from Device Profile category and tap to Samsung Mobile Video – Samsung Galaxy S6/Edge (MPEG4/H264). Step 3. If you have connected Samsung Galaxy S6/Edge to your computer, tap Browse button to set destination folder as Galaxy S6/Edge disk. Then, Click RUN button to start DVD to Galaxy S6/Edge conversion. 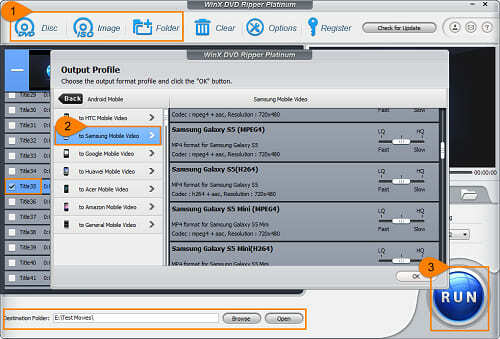 Tip: Apart from ripping DVD to Samsung Galaxy S6/Edge, WinX DVD Ripper Platinum/for Mac also available to rip DVD movies to MP4, AVI, WMV, MOV, MPEG, other Samsung Galaxy models (Note/S/A series) iPhone/iPad, HTC One, Sony Xperia, Google Nexus, Windows Phone, Microsoft Surface, Xbox, PS3/4 and MP3, AAC, iPhone Ringtone, FLAC audios with no effort at all.